TESTIMONIALS — FRIENDS OF PUBLIC SCHOOL HARLEM INC. It's with deepest gratitude that I write to you today. What started a small dream of taking a few book bags with school supplies to a few children in Dominican Republic with the help of the Friends of Public School Harlem has become a movement to support over 150 of poorest children in that country with book bags and quality school supplies for the start of their 2018-19 school year. Public schools in the Dominican Republic, where I was born, are often overcrowded and lack the resources and materials students need to succeed. About 40% of public school students in the Dominican Republic drop out before eighth grade and many do not obtain the skills needed to succeed in high school. Families with means send their children to private school where there are more resources and teachers are better trained, but the poor get stuck in schools not adequately resourced and overcrowded. Many Dominican families barely have enough money to eat and keep a roof over their heads. School supplies like book bags, notebooks, pencils, and crayons are a luxury. With the help Friends of Public School Harlem students in three of Santo Domingo's poorest neighborhoods will be set up with quality book bags and school supplies like binders, notebooks, pencils, scissors, calculators, erasers and more. What kid doesn't love new school supplies? What started as a dream to help a few has become an organization that will regularly support some of the neediest students in this developing country. Thank you again Jerry Migdol and Friends of Public School Harlem for helping some of the most disenfranchised students start the school year better prepared to succeed and reach their full potential. I look forward to a continued partnership to support the students not only in Harlem but beyond. Opera on Tap’s mission is to create impactful opera experiences for our communities by engaging them where they live, while challenging preconceptions of what opera can be. Friends of Public School Harlem has been absolutely instrumental in our realization of this mission through their support of our Playground Opera program at PS 129 Harlem. This program transforms elementary school students into opera collaborators and stars through in-school workshops with artists currently working in the field. Now in our fourth year, Opera on Tap’s Playground Opera program builds community through creative collaboration, exposes children to the art of the possible, introduces students to classical opera literature and storytelling, and results in magical full productions in the schoolyard for fellow students and the community to experience and enjoy. 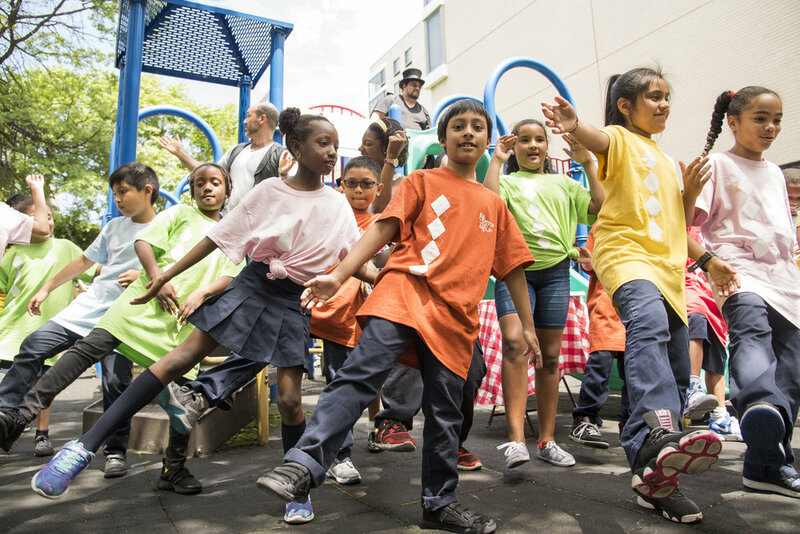 Playground Opera has become a grand part of PS 129’s culture, an impossible undertaking were it not for the generous support of Friends of Public School Harlem, which, year in and year out, has shown its commitment to culturally vibrant and enriched Harlem public school programs. We, and the singers, actors, and impressarios of PS 129 are so grateful for that. Friends of Public School Harlem has long been a strong ally and a true friend to the students at PS/MS 129. Every year, this organization has come through with iPads for our eighth grade valedictorian and salutatorian. When we started our Middle School after-school program, Friends of Public School Harlem provided laptop computers for each and every student enrolled. They have been an instrumental partner who has continually advocated for our school to receive more technology and even a brand new state-of-the-art Science Lab so that our students are prepared for college and careers beyond. They have made special arts programming possible through support of the Playground Opera program, involving our students in performances of professionally produced operas on our school playground. They have provided transportation via coach for school trips in and out of the city, on school days and on weekends. Their continued gifts of school supplies and backpacks make it possible for our students to attend school prepared and organized. PS/MS 129 loves Friends of Public School Harlem and will be forever indebted to them for their generosity and constant support of the children of our school community.